Please click here for full Terms and Conditions that apply when you order with The Silk Bureau Limited. Before placing an order you will be asked to agree to these Terms and Conditions. If you do not agree please do NOT place your order. Are you new to Digital Printing? 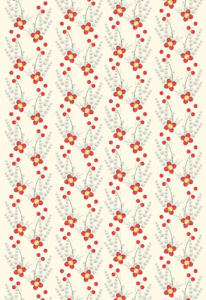 You have just created a wonderful design that you would like to print on one of our fabulous fabrics. Flatten your artwork. It is really important that your file does not have any layers in it. When transferring your files over the Internet they are vulnerable to corruption. Save as: tiff or jpeg. We can only accept these file formats for our specialist software. Check the size of the file. Both physical and memory. Look at the Document size. This is the best guide to see how big your print will be. This can also be checked when you upload through our website. The rulers on the top and down the side show in centimetres how much space your artwork will take up on the fabric. Also check how large the digital file is. We accept files up to 80Mb through our website. Keeping your files below this will ensure that the file arrives quickly and safely through to our CAD team. Some hints on keeping your files smaller. Use less filters when designing. Use Adjustment layers to edit your image. Keep the Resolution down to 180 dpi. If you are struggling to achieve a smaller file then you can contact us for a Large File Upload Link. This is password protected and you won’t be able to check the position on the fabric or the size of your file but you will be able to transfer it over the Internet. Just email or phone 01386 861122 for the latest password and link. Remember: The larger the file, the longer it will take for you to upload it and for us to download it. Which can also mean it is more likely to get corrupted during the process. When your artwork is ready to be sent simply go to our Order page and follow the step by step instructions. Is it a repeat pattern? If you choose yes you can see the design repeat in the fabric window. Add more images and choose different fabrics all in the one order. Complete the rest of the Order form with your details. You will receive a confirmation email that your order has been received successfully. If there are any problems someone in our CAD team will be in touch to advise. If this is the first time you have placed an order you will be contacted with the full Invoice so you will know how much it’s going to be before we print it. We recommend using Adobe Photoshop when designing and creating your files for print, and so the following guides refer to this software. If you prefer you can take a look on YouTube for our video tutorials. Tip: Simply type ‘The Silk Bureau’ into the search bar on You Tube or click here to see the tutorials in our website. 1. Launch Adobe Photoshop and create a new document set to the width of your fabric and the height to the metreage you would like. In the New window set ‘width’ to the width of the fabric you have chosen. In this case we are using Satin, so the width is 136 cms (see Fabrics page for details). Set the ‘height’ to a minimum of 100 cms. This is the mimimum print run we offer. If you need more metres, simply increase this height to your desired length. 2. Place your completed image onto the page you have just created. 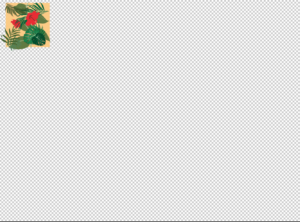 Move it to the top of the canvas and continue to place files until you have filled it. Tip:Try not to leave any space on the canvas. Find something else you could add or include some test images you might like to try. 3. When you’re happy with the layout you’ve created, it is important to flatten your image. 4. You’re now ready for the final save. Choose TIFF as the file format, and embed your colour profile by checking the box. Your file is now ready to send to us for printing. Please DO NOT include any special characters in the title of your files, such as @ These symbols cause issues when trying to download your files. Placing an order with The Silk Bureau is simple. Use our on-line file transfer and order facility. 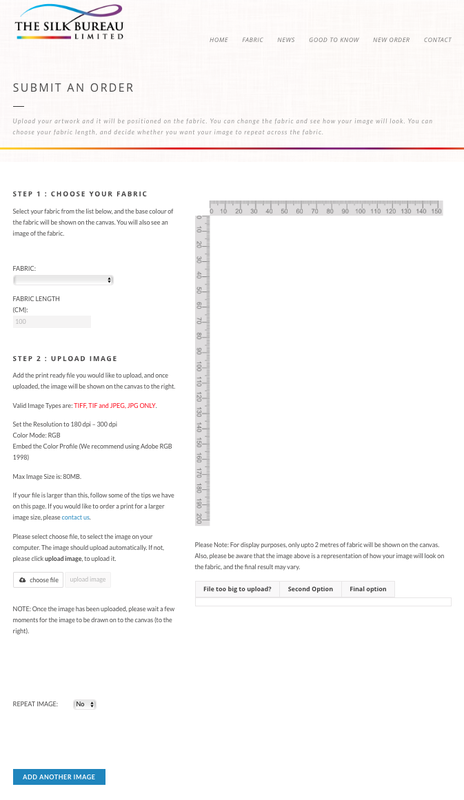 Simply follow the step by step guide to choose your fabric and upload your designs. Our file transfer facility accepts artwork upto 200Mb in size. If your artwork is larger than this please contact us for an alternative link. Flattened – Very important that there are NO layers in your file. .tiff or .jpeg – We cannot accept other file formats. We have found that files can easily become corrupt during the transfer process. Set the Resolution to 180 dpi – 300 dpi – Keeping your files closer to 180 dpi will help to keep the file size down. 300 dpi will result in a much larger file size with little benefit to the final print quality. Embed the Color Profile. – We recommend using Adobe RGB 1998. It really helps to make the colours more vibrant. If you have any problems uploading your file then please let us know. Once your file is uploaded you will receive a confirmation and our CAD team can start to work on your order. We will complete your Order according to the content of the Upload Order Form that you have submitted. Please be sure that you provide accurate information at this stage as it cannot be changed after submitting. Send a USB or disk and Complete an order form. Alternatively save your files on a Data USB or Disk. Please include your Order Form and post it to us in a padded envelope for safety. Ensure that your USB/Disk is named so that we’ll know it belongs to you. It will be returned to you with your printed fabric. Please ensure that you complete all the sections of the order form we will need these clear instructions in order to print your design correctly. Tip: You can download a copy of the Order Form here You will need to have Adobe Reader installed on your computer to complete this form on-screen. Would be good to know who we’re talking to! We may need to contact you urgently regarding your files and the Invoicing department will also need to contact you once your costs have been worked out correctly. We may need to contact you by email if we need additional documents from you, such as a Scarf Disclaimer, etc. All files need to be named and dated. i.e. Suzie Davies file A 1st January, File B 1st January, etc. 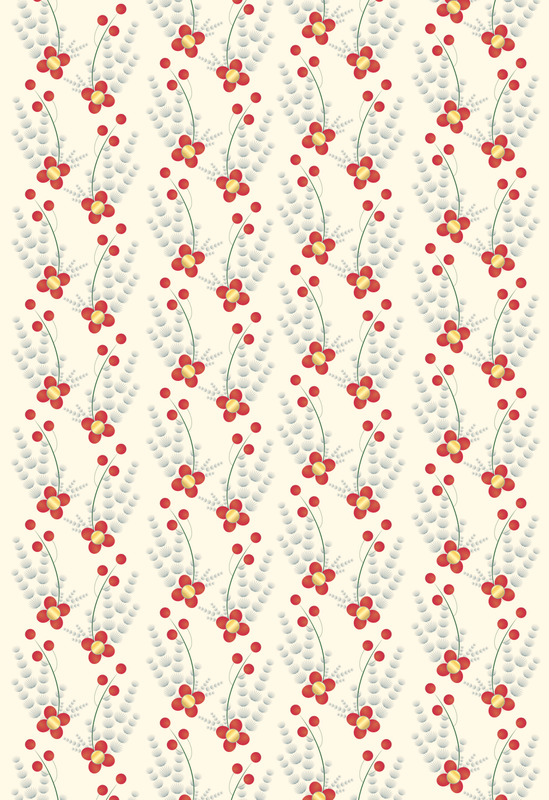 or Suzie Davies ‘Floral Bunch’ 1st January, etc. Please do not name them ‘The Silk Bureau 1’ etc. This is especially important when coming back for more orders at a later date so that we can find the correct file easily in the archive (files are stored for up to 12 months). Please remember to save them with the same name on your own system. We have an extensive range of quality fabrics available to suit your final product. Please state which fabric you have chosen. If you have several files that need to be printed on several different fabrics please note that there may be some colour variation between each. Our fabrics absorb the inks differently depending on its structure and the weave. If you would like some designs on Silk(acid dyes) and some on Cotton (reactive dyes) they will be noticeably different. How many metres of fabric are we printing for you? Or if you have a picture image how many of these would you like printed? Where are we sending your fabric once it has been printed? Are there any special requests or comments you need to let us know about? 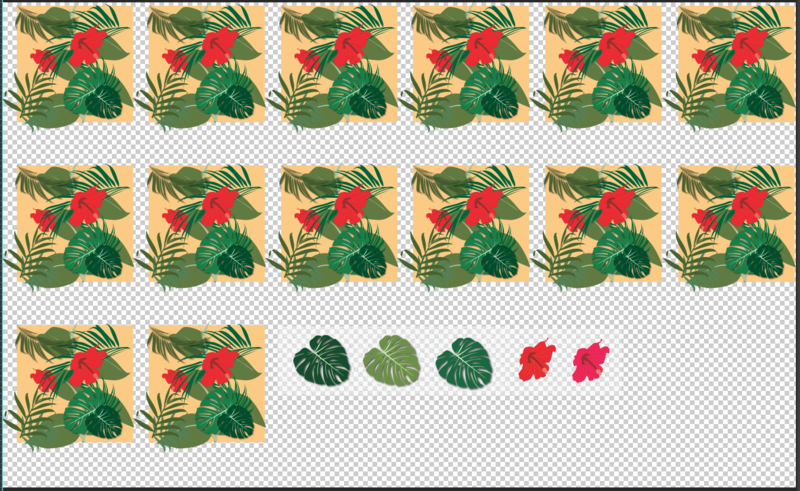 If you would like your design (tile) repeated across the entire width and height of the fabric then please check that it repeats correctly, without obvious join lines. You can check this in Adobe Photoshop by using the Pattern Fill Tool. Select the entire tile you have designed. Make sure that the resolution is 180 dpi. Create a new file at least 4 times larger than the repeating tile at the same resolution of 180 dpi. Select pattern in the Use drop downlist and then select your tile from the options available. Tip: It should be the last one in those available. Your original design will be repeated within the new file. Zoom in to check there are no gaps or obvious join lines. Tip: When you are happy that your image repeats correctly just send us the tile not the new test file. We can use that. Getting the right colour is very important for designers who have spent a great deal of time and effort in producing designs for a particular outcome. 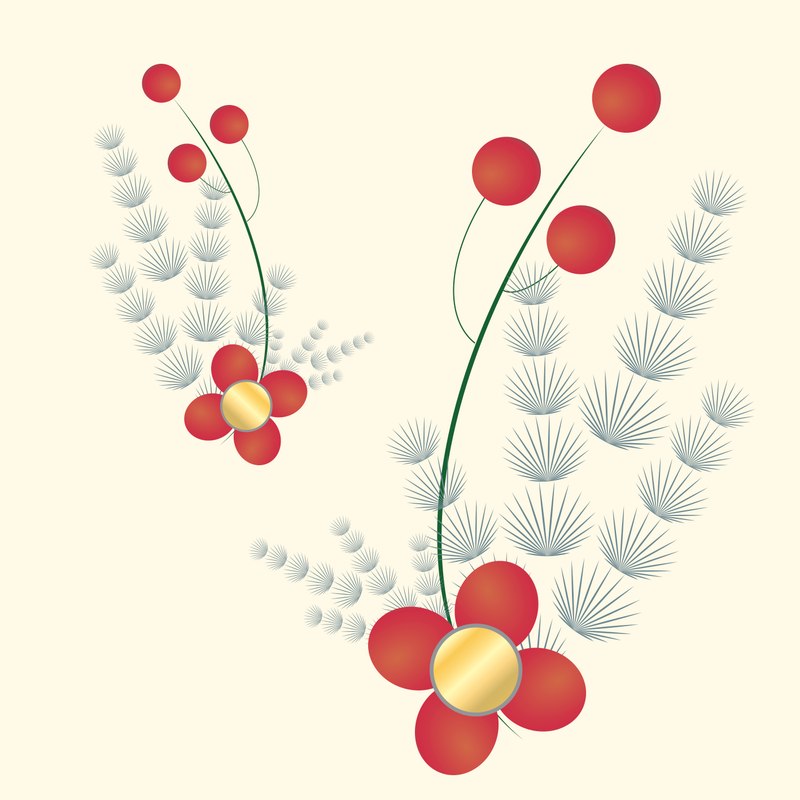 Here is a design that I have been working on. On screen the colours look just how I want them. But how do I know what it will look like when it’s printed? Will my printing match the colour of the accessories? Will my cushion fabric colour match my throw? What you see on screen may not print out the same on fabric. It’s a huge challenge to match colours from different materials but you can get quite close with the right testing. The best exercise is to invest in a sample template created from your design printed in a variety of colour ways on 1m of fabric. We are using the designer software package Adobe Photoshop for this guide. 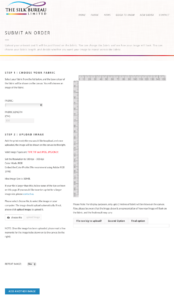 Launch Adobe Photoshop and create a new document set to the width of your fabric and to a maximum height of 100cm. Set the ‘height’ to a minimum of 100cms. This is the minimum print run we offer. So cram it full of all the test you can think of. 2. Copy and Paste your Original design into the New file. Move it to the top corner of your New file. The design I have selected has a number of colours in it that I might want to vary in the final production. I can now create a variety of colour ways from the whole design and also create colour chips from the dominant colours of green, yellow and red. 3. Repeat the design several times or add details of the design for a closer look. Colours can be adjusted within each sample to give a slightly different finish and to see how they look in close proximity to each other. Select each layer individually and experiment with different colours and values. Colours can react differently depending on the colour they are positioned next to. For example a Yellow next to a Blue may look a little Green where they connect. The same Yellow might look more Orange if it where placed next to a Red. By adding a strip of colour chips under the design you are able to quickly replicate them again for your final production. 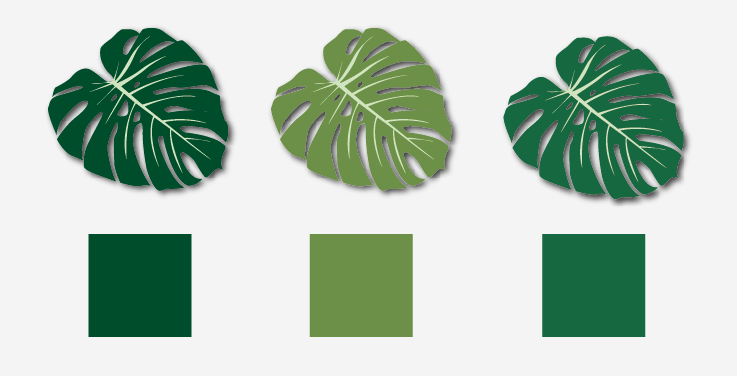 Which green works best for my leaf? You may want to experiment with the design using adjustments in Photoshop. These can be as subtle or as dramatic as you wish. Remember to label each adjustment on the print so that you can replicate it in the final production. Finally flatten and Save a copy of your file as either a jpg or tiff. Once your fabric is returned to you, you will be able to make an informed decision on the right colour way to choose. Simply apply the same colour choice to your original file and save for production. The minimum length we can print is 1 metre. There is NO maximum. 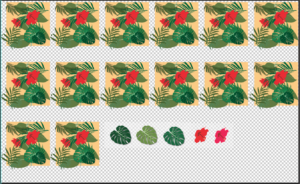 It is not a good idea to design for specific placements of pattern or pattern pieces within your files. The degree of shrinkage is not exact. Because of the high risk involved with panel and placement prints, there maybe an additional charge of £1 per meter depending on your artwork. Please contact us if a placement or panel piece is important in your design. Your digital print file will not be the same size as your final fabric. As the post printing process will cause shrinkage. We do NOT colour match. Please be aware that we can only print the detail our system reads on your tiff files. We have a very sophisticated colour calibration system, which picks up virtually all colours possible. Occasionally there are colours that are not able to be reproduced from the colour gamut of the dyes we print with. The colours that you see on your monitor may not be the same as we see on ours, as everyone has their monitor set slightly differently. If you are planning on ordering a large run we always advise to order a sample first so that you can test that the colours printed are the ones you want. We will print your designs as soon as possible after receiving your files. Lead times can vary throughout the year so please allow plenty of time to meet your deadlines. If images are not sent in the right format or files are corrupted for any reason this will delay printing. Please refer to our pricelist to work out costing. Once the fabric is ready we will phone you for your payment by credit/debit card. We will then post your work by courier (bags £9.75 – rolls start at £19.50 – scarf boxes £19.50). There is an extra charge for deliveries requested before 9:00am, 10:30am and 12:00am, or on a Saturday. International client orders. We will raise a proforma for your order and ask for payment prior to commencing the printing. Courier rates will vary according to the speed of delivery and the weight of the parcel. NB: Velvets and other Heavy gsm fabrics may need to be delvered on a roll due to the nature of their construction. All orders submitted are subject to The Silk Bureau’s standard Terms & Conditions (available on request). 2. Your Discount Voucher should be noted in the Promotional Code box on the order and must be authenticated by an authorised Silk Bureau employee at the show. 3. Discount must be redeemed by the date shown on your voucher. 4. You will have the option to complete a direct consent to contact form or Subscribe to our Newsletter via our website. 5. Our 15%, 20% and 50% discount offers will be applied against a maximum of 10 metres fabric and printing costs. 6. In the case of orders for various fabric types, discount will be applied to the lowest price fabric up to a maximum of 10 metres. 7. Discount does not apply to postage of fabric via courier. 8. Artwork supplied must be print ready. The Silk Bureau will not reprint any orders of fabric with artwork-based errors. 9. Discount is strictly limited to one offer per customer and is non-transferable. 10. The Silk Bureau reserve the right to i) cancel an offer at any time ii) amend terms and conditions relating to Show Offers. Good to know hints and tips when designing scarves for digital textile printing. If an even colour is important on your scarves, it is best to select a lighter weight fabric from our range. If the fabric is thinner and has a loose weave, it enables more colour to penetrate through the fibres onto the reverse of the scarf. Popular choices are Light Satin, Single Georgette, Habotai, Light Crepe de Chine, Crepe de Chine, Silk Modal and Poly Chiffon. Our suggested fabrics have been chosen for their good colour penetration and drape when worn. Silcott Voile and Silcott Habotai, which are also lightweight may not achieve colour penetration quite as well as the others but are still popular as alternative choices. Our experienced print operators are practiced in getting some pretty tricky fabric weaves to print very straight, however, silk is a natural fabric and the weave is sometimes irregular, especially on finer fabrics. This can occasionally be further distorted during the coating of the fabric. As the fabric comes directly off a roll, it is fed on to the printer and adheres to a permanent adhesive belt. At this stage the fabric cannot be manipulated or adjusted. Prints, which have borders and straight lines, are more at risk of noticable distortion through weave movement than ones with all over patterns. There is a higher risk of this in lighter weight fabrics, such as Chiffon, where the straightness of the weft can vary dramatically through a roll. During the digital textile printing process shrinkage occurs. This can vary according to fabric type and the processes involved in production. As much as possible, we will take additional measures to bring your scarves back to the original size you have stated in your order. You may also be interested in having your scarves hemmed and finished ready to wear. We do offer a hemming service. Our finishes include; Machine Pin Hem, Hand Finished Roll Hem and Eye-lash Fringe. The scarves will be returned to you with your choice of finished edges, including your label and a fabric care label sewn in. The label will say ‘Dry Clean Only – Made in the UK’. Each scarf will have been individually pressed and packed in a clear cellophane bag. If you would like to use our hemming service please contact us for current lead times from us receiving your artwork and order for your scarves to be returned. Remember to send your labels with the order and a drawing if you would like the labels sewn in a particular position on the scarves. Unless otherwise instructed we will place the labels 3 – 7 centimetres away from the corner, as is normal on most scarves. Please remember to include a 1mm space between your scarf files to show a clear cutting line. This is particularly important if you have included white borders. Please use a pale grey or cream cut line so that it does not show on your scarves. The majority of our fabrics have a printable width of 136cm. Consider this when you are submitting your artwork for print, so that you can utilise as much of the fabric and avoid unnecessary waste. See diagram. Fill as much of the space as you can but allow 1mm for cutting between scarves. If you don’t have a coloured border or you have white space around your scarves, please add a fine cutting line. This will help when it comes to cutting out and finishing. Remember to allow for the hemming too. Allow approx. a 1cm border that will be tight rolled up to the design, to give a ‘Pencil Hem’. Alternatively, allow a 1.5cm border that will be rolled to leave approx. a 1cm plain border around your scarf. Perhaps add a 1mm cutting line for a clear indication of where you would like the cut to be. Think about borders and geometric designs. Straight lines that are printed onto a weave that is not exactly straight may well end up ‘wavy’. By incorporating a larger area of colour at the edges you can still create an effective border that will give more tolerance for cutting and hemming. 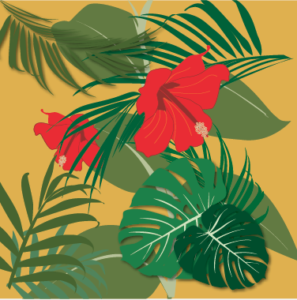 The Silk Bureau Ltd will always endeavour to produce printed fabrics of the highest quality, but cannot be held responsible for any weave quality issues that originate with our suppliers. The total surface area of your scarf may include slight anomalies associated with the process of digital textile printing. Minor inclusions such as; ink spots, water marks, loose threads, slubs, wavy lines, thread rotation and surface lint within the printed area will be considered as acceptable by Quality Control. We will not approve any scarves that we consider contain large inclusions. These will have been rejected and reprinted prior to dispatch. Claims for any defects or shortages must be made in writing within seven days of delivery. What is a Fabric Bruise? All woven fabric can suffer from bruising when enough pressure is applied to it. Bruising can occur when force is applied to the weave, distorting the weft and warp from their original directions. The pulling apart of the threads leaves a mark that looks a little like a bruise, hence it’s name. Take a look at this short video clip where force is deliberately applied to the bias on a wool scarf. There are occasions when the bruising can be repaired by gently teasing the threads back into position, as this video shows. This is quite common in lightweight, open weave fabrics. By nature they are more delicate and more susceptible to damage. It is important to choose your fabric according to it’s intended use and the care it requires. Block colours will highlight a bruise, where as multi-coloured, multi-patterned designs disguise bruises that may happen over time with use. 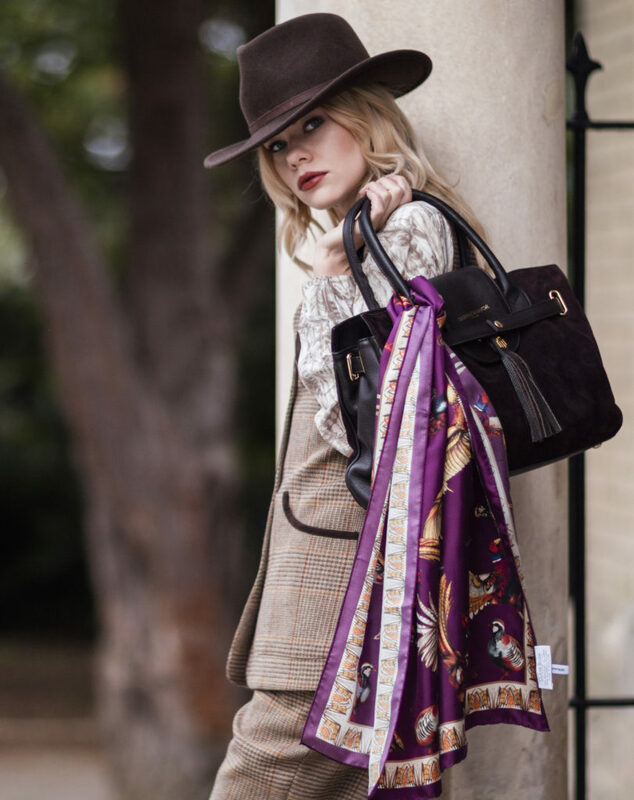 Fringe hems can look especially effective on soft wool fabrics, however there are some rules to follow when designing scarves that you would ultimately liked printed onto this base and have the fringe hem finish option. The loose weave of the fabric makes it impossible to keep the weft and wharf threads at right angles. This impacts on the printing and therefore the fringed hem. Take a look through this video for what can happen when creating a fringe hem. Best design practice is to have an all over design that runs from edge to edge. A border will highlight the uneven weave. I just wanted to email to say how delighted I am with the silk scarves you have printed for me. The colours, print quality and hand finish are all superb. As a first order it was quite an experiment for me but your help and service at The Silk Bureau have been fantastic. I look forward to placing more orders. Just to say that I am absolutely over the moon with my latest scarves. The first time they were beautiful, but now that they are double faced in the silk satin, they are a dream…..the drape, hemming finish and colour could not ever be improved upon. I got my printed samples in the mail yesterday and I just want to say that I am blown away by the crispness and color accuracy of the prints– they’re stunning! I am so, so pleased that such a quality digital-printing company exists in the world. It’s a rare thing. I received my scarves today and would like to thank you all very much! I am thrilled with them and hope to order more soon. I have been really impressed with the personal and attentive service I have received throughout the whole process. I just wanted to say that I just received my first silk scarves, and I am absolutely blown away with how they look, truly they are superb! I cannot wait to get selling them! I think you guys are wonderful, you have helped me rush through things on a couple of occasion now and the standard of your printed is exceptional. Believe me I have tried a few places before I came to you you quality is way better. Everyone I speak with there is always so kind and helpful. Thank you you are an absolute pleasure to work with. I am so happy to have found you. Can’t wait to get the full collection printed now. OMG…. You have done a superb job…….. the detail , colours and fabric are absolutely stunning , a huge THANK YOU to the team !!!!!!! I received my package on Saturday and I want to say how delighted I am. It is stunningly beautiful and the colours are exactly right. As a painter of the natural world, I think your colour reproduction is perfect. Every variation of colour in my pastel drawing of the Ash tree at the stone circle is remarkably accurate and beautifully replicated. I am really pleased with my scarves, they look really good and are even more vibrant and colourful than I had imagined. Fantastic. Great service, produced very quickly. We just received our first print run and I just wanted to say thank you for the lovely quality. The saturation, depth and sharpness of the print is amazing as is the quality of the Silk CDC. We will be sending you more work very soon. I just wanted to say thank you SO much for the marvellous job you have done on my silk scarves. I’m truly delighted with them and the quality of the print, fabric, finishing and exquisite hemming is superb! Many many thanks and here’s to producing more in the future. Our samples arrived this morning. They are fantastic, the quality of print and finish are lovely – thank you all for providing a great service! Your team are extremely knowledgeable and helpful plus the time frame for sampling was so quick. Really pleased we started working with you guys. Please let me tell you that I printed textiles for almost 15 years, including my work in Ratti, Italy. However the quality of print that you produced is one of the best I saw, if not the best! I was absolutely excited to see the result, and I’m sure that the combination of our designs and your superb quality will produce amazing commercial performance. Thank you so much for your help! I look forward to receive the second run very soon. I really appreciate all the communication and assistance I have received over the last few days from various staff members, particularly in consideration of time limitations and this being our first time ordering with The Silk Bureau. The customer service has been fantastic and we hope to work with you again in the future, under less time pressure. Oh my goodness!!! The sample has just arrived, it is absolutely STUNNING! I cried! The colours and the fabric has exceeded my expectations! I received my prints for Premier Vision from yourselves on Tuesday and wanted to tell you how pleased I am with them. The quality and colour matching are fantastic and the fabric really shows off my designs. When I phoned for help the lady at the end of the line couldn’t have been more helpful! The quick turnaround has also taken a lot of the stress away. Thanks so much for your support in preparing the collection and can’t wait to show it in Paris in the coming weeks. I will definitely be using your services again in the future. I received my sample scarves today. They are really very nice and I am extremely pleased ! The colours are much more vibrant than I expected and the edge hemming looks great. I received the scarves today and am very happy! Thanks to you and your team for doing a great job and for being so helpful and efficient. Just wanted to say a big thank you for my scarves! They came out beautiful, really pleased with them. The colours came out just as I had on my files and the rolled hem finish is beautifully done. Thank you! I just want to thank you for the great service and perfect result! I’ve received the silk a while back and it just looks amazing! Hello would just like to thank the team on such an amazing job on my print very happy with it and the quality is lovely. Will be definitely be using your service again. I received my design, printed onto silk chiffon and it looks absolutely perfect. Thank you so much I am so happy! I just wanted to say a huge thank you for getting those scarves out to us today. They look really amazing and we are really pleased with the quality of the print and hemming. I also wanted to say- thank you so much for the Spring/Summer 2016 sampling, they really came out beautifully (as usual! ), and I’ve received so many compliments on the feel of the fabric, and the vibrant colours of the Silk Chiffon Scarves. Thank you SO MUCH for the most beautiful silk prints! They are magnificent and I am over the moon! You really are miracle workers – thank you so much! I would just like to feedback how excellent my experience with The Silk Bureau has been throughout this year. As a final year fashion design student I have constantly been working towards tight deadlines and The Silk Bureau always ensured that my prints were back to me as quickly as possible. All members of staff were always lovely and helpful and I would recommend the company to anyone! Thank you so much for all your help and efficiency. This is just a little note to thank you and the guys at the Silk Bureau for sorting out our fabrics. We are really happy with the quality. We’re doing a photoshoot tomorrow to get ready for the launch and the scarves are going to look great. We’ll be in touch with another order soon. I just wanted to let you know I received the samples today that you sent. They are absolutely stunning and we’re very happy with them!! I would like to say thank you for the first batch of printed fabric that I received. I am so pleased with the result. The turnaround time was very speedy and the quality of the fabrics are beautiful. The Silk Bureau is by far the best digital printers around! Just to let you know I received the print several minutes ago and it is just perfect! Looking forward to our further co-operation. Thank you very much. 100% Perfect in every way, excellent quality, very quick turnaround. Never had any problems and excellent customer service. You are SO well known in the industry for your perfect service and print and quite rightly so. You are an example all should follow! Fabulous and amazing, would never dream of going anywhere else. Everyone I speak to on the phone is so friendly and polite. I must mention that when showing the samples of your printing, the quality outshines all.